With this year’s offseason moving slowly, the flood of veteran non-roster invitees or low-level signings hasn’t happened yet. Therefore, there’s plenty of reclamation projects or mid-tier players still on the market. And that’s mostly what the Yankees are looking for at this point. Perhaps there’s a $10 million second baseman or starting pitcher that they’ll add in the coming weeks. I’d bet though that the Yankees are more looking on the fringes of the roster. Those high-risk, high-reward types either coming off an injury or bad season that may have a bounce back, or just a dead-cat bounce. So here’s four pitchers worth a look. I wouldn’t toss the rest of the Yankees’ money under the luxury tax at these guys, but they could be worth a look in Spring Training, or a month in Scranton if they’re willing to go back to the minors. Some of them could even be worth MLB deals. The knuckler! 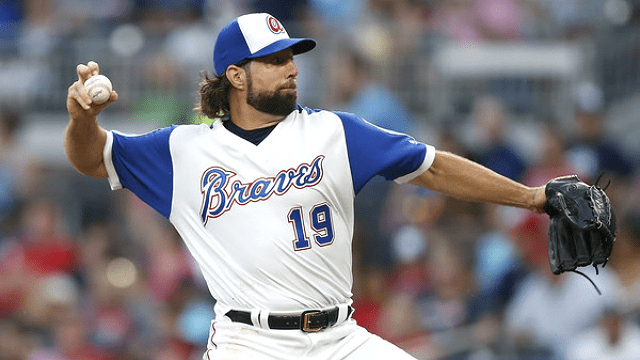 If you’re looking for a player that will rebound and then give your team a few years of value, I wouldn’t be looking at Dickey. At 43, there’s a limit on how much longer he’s going to keep pitching. Heck, even though he reportedly has offers on the table right now, he still may retire right now. After a series of middling years in Toronto, he went to Atlanta and was essentially average. Almost exactly. His 4.26 ERA was good for a 99 ERA-. His ERA- the last five years go as follows: 104, 96, 96, 105, 99. Average as can be. He’s nowhere close to his 2012 Cy Young numbers when he struck out nearly a batter per nine, held his walks in check and wasn’t half bad limiting homers. You’re not seeing 2012 Dickey (when, fun fact, he became the most recent Mets pitcher to lead the NL in strikeouts). But there is one thing you’re essentially guaranteed with the middling performance: Innings. He’s thrown at least 169.2 innings each of the last eight seasons and 190 or more in six of those. He made 31 starts a year ago and there were some real gems in there. As always with Dickey, there are some clunkers as well with the knuckleball not twirling quite as well. If the Yankees want a sixth starter, he’s a perfectly fine pitcher. Toss $6-7 million his way and you can basically count on somewhere between one and 2.5 WAR. Yes, him! That Clay Buchholz. The last time he was on a mound was in April, when he suffered a torn flexor muscle in his right arm after 7.1 bad innings with the Phillies. His 12.27 ERA was indeed representative of how he looked over two starts. The bet on this former Boston All-Star would be that he would return to his 2016 and earlier form. Now, if you look at his overall 2016 numbers, they’re not great. But his second half was a sign there was something left, actually earning him a meh playoff start. Finding his way in middle relief before returning to the rotation, Buchholz adjusted his pitch mix, going up and in on hitters more often and lessening his reliance on his sinker. It worked for a few months, but one would have to think going back to his sinker would be necessary if he made Yankee Stadium his home. Buchholz has always been injury prone, not topping 190 innings and not even reaching 170 since 2014. He hasn’t posted strong full season numbers since 2015 and that was over 113 innings. However, even though he made his MLB debut in 2007, he’s only 33 and could still have another strong half or two in him. The previous two names have been more familiar due to their time in the AL East. Putnam is a relative nobody in comparison. And I’ll give you the red flags up front. He is a 30-year-old pure reliever who barely tops 90 mph with his fastball and just underwent Tommy John surgery. He’s out until midseason at the earliest. But here’s why he could be the perfect buy-low candidate: his splitter. Before he joined the Chicago White Sox in 2014, he wasn’t much to notice. But then he began using his splitter between 55 and 70 percent of the time, even more than his four-seamer and cutter. He knew what was working for him and he went with it. Your browser does not support iframes. His control is below-average and he’ll live and die with the splitter. But he should be available for a MiLB deal and is a solid low-risk addition for bullpen depth. I’ll admit it: I looked into Ubaldo. After all, he was worth 2.7 fWAR just two seasons ago and had a fine K-BB% last year. But I just couldn’t throw out two seasons of downright bad performance, even if you believe he isn’t the walking home run machine he was last year. Fewer walks and more flyballs make Ubaldo a pitcher to stay away from. But I’m slightly intrigued by Tillman, his rotation mate the last few years. 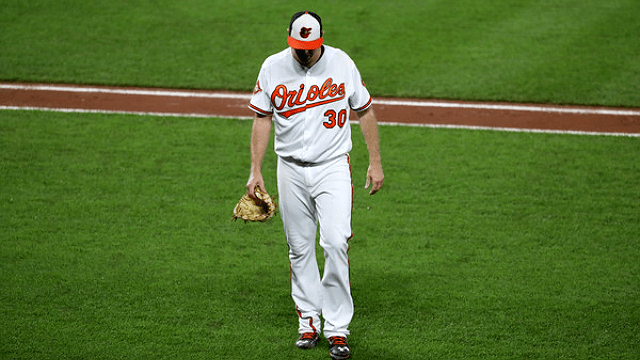 For pitchers to throw at least 90 innings last year, Tillman (7.84 ERA) was the only pitcher worse than Jimenez in all of baseball. It’s amazing the O’s won 75 games with those two taking up more than a full spot in the rotation. As Mike said in November, Tillman is only worth it if you believe he’ll be back to form further removed from shoulder surgery. At that time, it was questionable whether Tillman would settle for a MiLB deal, but that seems inevitable at this point. And if you can get him on a spring invite, why not? This is a pitcher who found ways to limit home runs and outperform his peripherals even while pitching at Camden Yards. Who says he can do that at Yankee Stadium? He’s made his living in the AL East. I doubt he’d want to rebuild his value at the #littleasspark in the Bronx and with the Yankees’ limited room for another starter, but from the Yankees’ side, he’s worth a tryout. The Winter Meetings officially come to a close today, and the rumor mill should start to dry up around noon (probably sooner) after the clubs flee the Gaylord Opryland. The two biggest free agents (Zack Greinke & Josh Hamilton) are still on the board and the Yankees haven’t done a thing other than announce Alex Rodriguez’s new hip injury. Somehow they’re actually going to leave this week with more questions than when it started. The Rule 5 Draft starts at 10am ET and I’ll have a liveblog up for that, but otherwise this is your thread for various Yankees-related rumblings throughout the day. Here are Monday’s, Tuesday’s, and Wednesday’s rumors. All times are ET.